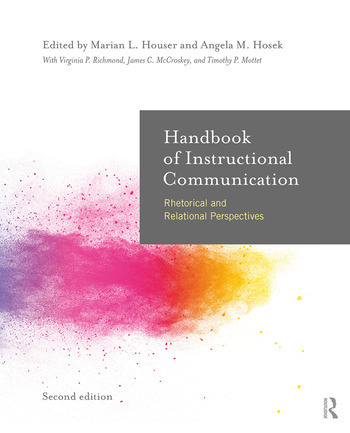 The Handbook of Instructional Communication offers a comprehensive collection of theory and research focusing on the role and effects of communication in instructional environments. Now in its Second Edition, the handbook covers an up-to-date array of topics that includes social identity, technology, and civility and dissent. This volume demonstrates how to understand, plan, and conduct instructional communication research as well as consult with scholars across the communication discipline. Designed to address the challenges facing educators in traditional and nontraditional settings, this edition features a wealth of in-text resources, including directions for future research, suggested readings, and surveys for instructional assessment. Chapter 3 - Instructor Credibility. Chapter 4 - Student Participation and Engagement in the Classroom. Chapter 5 - Instructional Dissent..
Chapter 6 - Student Orientations toward Communicating in the Classroom. Chapter 7 - Immediacy and the Teacher-Student Relationship. Chapter 8 - [Re]Negotiating Power and Influence in the Classroom. Chapter 9 - Rapport in the Instructional Context. Chapter 10 - Communication Perspectives on Classroom Emotion. Chapter 11 - Race/Ethnicity in the Classroom. Chapter 12 - Sexual and Gender Identity in the Classroom. Chapter 13 - Human-Machine Communication in the Classroom. Chapter 15 - Cognitive Approaches In the Instructional Context. Chapter 16 – Affective Approaches in the Instructional Context. Chapter 17 - Biological and Physiological Approaches in the Instructional Context. Chapter 18 - Critical Communication Pedagogy. Marian L. Houser (Ph.D., 2002, University of Tennessee-Knoxville) is a Professor in the Communication Studies Department at Texas State University. Her research focus is instructional communication and the student-teacher relationship in various contexts that include organizations, training, health campaigns, and interpersonal relationships. Dr. Houser was the recipient of the Texas State Presidential Award for Research and recently named an Eastern Communication Association Research Fellow (2016). Angela M. Hosek (Ph.D., 2011, University of Nebraska, Lincoln) is an Assistant Professor and Basic Course Director in the School of Communication Studies at Ohio University. Her published research focuses on student-teacher relationships, social identity, privacy and discourse, social media and student success in the instructional context. I was heartened to see that the revised Handbook of Instructional Communication softens the boundaries of what constitutes instructional communication research, integrates a variety of constructs and perspectives, relies on respected prolific authors, and effectively incorporates theory, research, and practice. The editors, Hosek and Houser, are to be commended on this effort to highlight the best of our instructional communication scholarship.